Տարբերում են պրոտեզների մի քանի տեսակ. ‘Biomechanics of running: from faulty movement patterns come injury.' Sports Injury Bulletin. 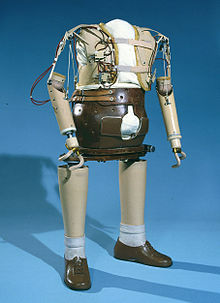 Edelstein, J. E. Prosthetic feet. State of the Art. Physical Therapy 68(12) Dec 1988: 1874–1881. Gailey, Robert. The Biomechanics of Amputee Running. October 2002. Hafner, B. J., Sanders, J. E., Czerniecki, J. M., Ferguson, J. Transtibial energy-storage-and-return prosthetic devices: A review of energy concepts and a proposed nomenclature. Journal of Rehabilitation Research and Development Vol. 39, No. 1 Jan/Feb 2002: 1–11.